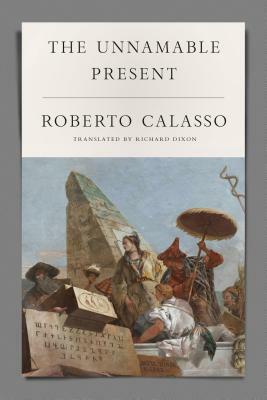 The ninth part of Roberto Calasso’s work in progress, The Unnamable Present, is closely connected with themes of the first book, The Ruin of Kasch (originally published in 1983, and recently reissued by FSG in a new translation). But while Kasch is an enlightened exploration of modernity, The Unnamable Present propels us into the twenty first century. Tourists, terrorists, secularists, fundamentalists, hackers, transhumanists, algorithmicians: these are all tribes that inhabit the unnamable present and act on its nervous system. This is a world that seems to have no living past, but was foreshadowed in the period between 1933 and 1945, when everything appeared bent on self-annihilation. The Unnamable Present is a meditation on the obscure and ubiquitous process of transformation happening today in all societies, which makes so many previous names either inadequate or misleading or a parody of what they used to mean. Roberto Calasso, publisher of Adelphi in Milan, is the author of many books, among them The Ruin of Kasch, The Marriage of Cadmus and Harmony, Ka, K., and Tiepolo Pink.